Geology of meteorites and the early Solar System : what can we learn from chondrites ? lMeteorites are essentially rocks from space that fall to Earth. The very small ones burn up in the atmosphere, leaving light trails we call meteors, or “shooting stars”, but the larger ones that make it to the Earth’s surface are called “meteorites”. I’m a geologist by day, but an amateur when it comes to things astronomical. So, for me the excitement comes from trying to understand the geological processes that meteorites represent that led to the evolution of the rocky planets in the inner part of our Solar System. Meteoriticists - which is almost as easy to pronounce as prestidigitatist (tech-speak for “magician” !) 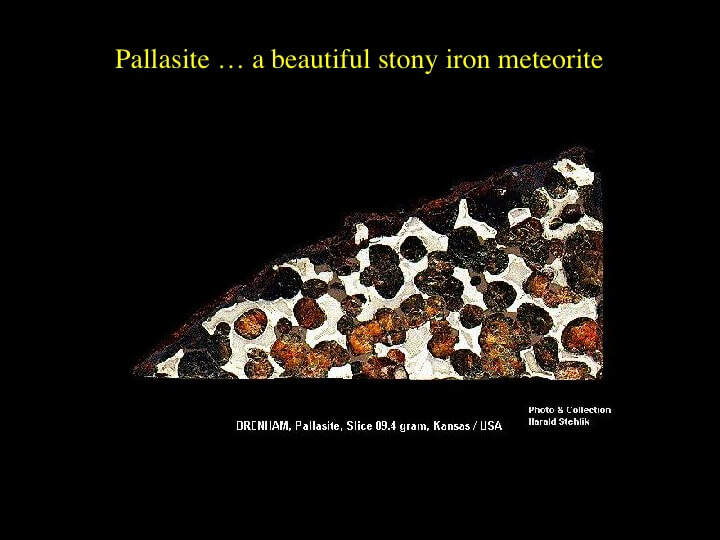 - have developed an incredibly complex classification system for meteorites that is extremely difficult to remember, so most of us fall back on the simple division into meteorites made of iron, those made of stone and those made of mixtures of the two (stony irons - as in this image). Geologically, this translates into the inner and outer parts of rocky planets such as the Earth, Mercury, Venus or Mars. there’s a thin shell we call the “crust”. an inner yolk we call the “core”. and a whole load of egg-white we call the “mantle”. the continents we live on are made of "granite" (really granodiorite), which is full of silica. while the ocean floors are made of basalt, which has less silica and more iron and magnesium. Both of these rock types would be called “stones” by meteoriticists. Although we like to think of Earth as the “typical” planet, it’s not ! Mercury, Venus and Mars also have crusts, but they are almost entirely made of basalt. This is very important because there are no granitic meteorites - and the absence of granite on other rocky planets explains why. Geologically, meteorites are divided into two major populations: chondrites and the rest - achondrites. “Chondrite” is a bizarre concept. All of the planets from Mercury to Uranus (let’s leave Pluto out of this for now !) formed by accretion from a disk of dust and gas that surrounded the early Sun : the Solar Nebula. Because of the temperature gradient in the nebula - hotter nearer the Sun and cooler further out - the inner part of the Solar Nebula quickly lost most of its hydrogen and helium gases, before any planets had formed. The left-over stuff still had the same chemical composition as the rest of the Sun, and this is what went into the initial mix to make the rocky planets, including the Earth. This primitive, pre-planetary composition of the nebula is what chondrite meteorites are made of, and it’s the same composition as the Sun minus the H and He. In other words, the dregs of the Sun without the gas. The process of making planets out of a nebula of dust and gas involves the bits of dust “accreting” or sticking together to make larger grains of stuff, that then stick together to make larger lumps, and so on until you’ve got a body large enough that it can exert some serious gravitational attraction and start pulling other stuff and lumps towards itself. Most of them inhabit a doughnut shaped volume of space between the orbits of Mars and Jupiter called the Main Asteroid Belt. According to a remarkably simple, but accurate observation made long ago by two gentlemen by the names of Titius and Bode, the planetary orbits occur at predictable periodic distances from the Sun and there should have been a planet between Mars and Jupiter. 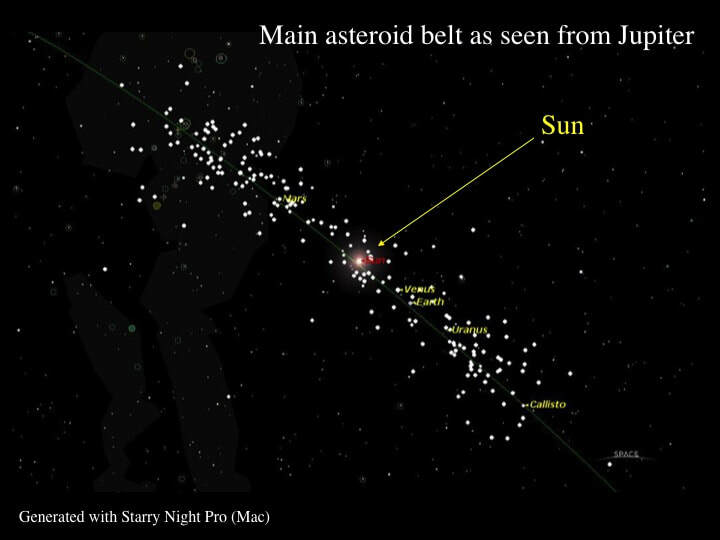 Instead, we find the main asteroid belt. How do we know that these asteroids represent a planet that never formed, rather than a planet that disintegrated ? 2 reasons: #1: The accumulated mass of the asteroids does not represent a full sized planet. #2: More importantly, their chemical composition! However, we need to go back and look at meteorites before we can explain that one. lRemember, for the planetary geologist, there are two kinds of meteorite … chondrites and the rest. The name “chondrite” comes from the Greek word for “seed”, and was inspired by what you see when you look closely at some chondrite meteorites, especially under the microscope. Chondrules : small, round beads (0.5mm to 1cm), commonly set in a matrix of very fine black material (devitrified glass). ​These chondrites have the same chemical composition as the Sun (minus H and He gases), and therefore they have the same chemical composition as the primitive Solar Nebula before the planets had formed from it. This is why that primitive chemical composition is called “chondritic”. However, some meteorites with chondritic chemical composition do not contain these round chondrule structures. What’s going on here ? ... or the same minerals that have crystallised as radiating needles (like sheaves of wheat). These textures tell planetary geologists that chondrules are balls of melt that were chilled very quickly (quenched), before large, well-formed crystals could form. We’re talking hours to days here ! Now, think about this for a moment. How do you produce small balls of molten lava and then suddenly freeze them in a Solar Nebula Frankly, no-one’s sure, but there are a number of ideas out there. For example, one involves sweeping interplanetary dust-balls close to the Sun - where they would melt in the hot inner nebula - and are then thrown out rapidly into colder parts of the nebula where they quench. Frankly, the distances involved are huge, and the speeds are limited, so I don’t really see how the cooling could occur quickly enough. Another idea involves flash melting due to a sudden temperature increase produced by fluctuations in the Sun’s magnetic field. This at least has the advantage that the temperature could vary extremely quickly. lWhatever, the debate continues, but melting of dust-balls and their rapid cooling has to be part of the story, however it is accomplished. lSo, what about chondrites with no chondrules ? They are the product of the accretion of primeval dust that inhabited the outer parts of the Solar Nebula where things were simply too cold for melting to occur, hence chondritic composition without the chondrules. No-one ever said that planetary geology was straight-forward ! It also turns out that the chondritic meteorites with no chondrules have lots of carbon and contain minerals with lots of water bonded into the crystal structure (clays and serpentinite - which is olivine with water added). These are the most primitive of the carbonaceous chondrites ... for those familiar with the term. Again, the presence of all that water (up to 22% by weight) is evidence for an origin well removed from the hot Sun. Now, what does all this have to do with asteroids and planets ? Well, apart from meteorites that fall from time to time, there are no rocks of chondritic chemical composition anywhere on any of the rocky planets, or Earth’s Moon, and no rocks that contain the chondrule structure. Why not ? Because all the chondritic material that originally accreted to make the planets has melted, and the heavy stuff has sunk to the centres of the planets, while the and light stuff rose to the outsides. 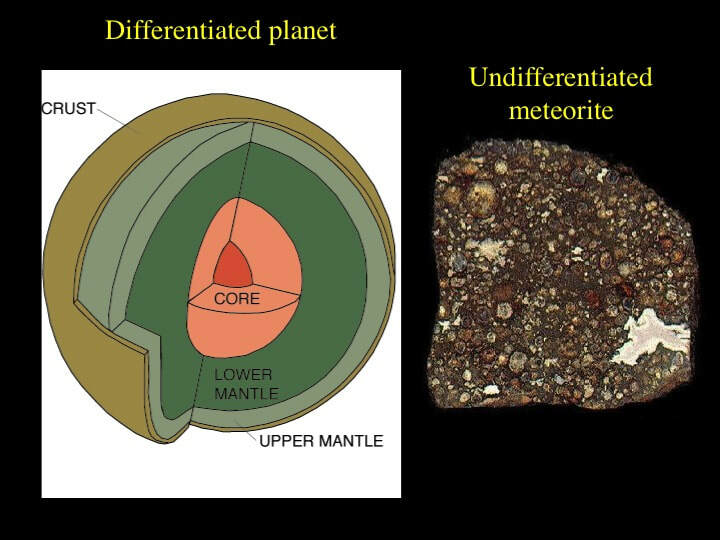 Technically speaking the planets have “differentiated” such that no one piece of rock has chondritic composition anymore and the chondrule structure has been destroyed. in other words, rocky planets are made of “achondrite” materials. Frankly, from a purely geological perspective the presence or absence of differentiation could represent the criterion for defining a planet. Maybe this would settle the debate about whether or not Pluto should keep or lose it’s planetary status. However, some asteroids - such as Vesta - also appear to have differentiated into core, mantle and crust, so the waters remain muddy ! So, how does all this help interpret the asteroid belt ? Well, it turns out that a lot of asteroids in the asteroid belt have a chondritic chemical composition, which means that they cannot be part of a differentiated planet that then broke up, otherwise they would not be chondritic, would they ? #1 : Because planets have differentiated, primitive chondrite meteorites must be derived from asteroids that never accreted to form planetary bodies. #2 : Carbonaceous chondrites are samples of the colder, outer parts of the Solar Nebula, while other chondritic meteorites come from closer to the Sun. #3 : Chondrites are pieces of the early Solar System. But what about the other meteorites, the achondrites ? Well, they hold many clues regarding the true nature of the asteroids, and it turns out that it’s not as simple as some would have us believe, but that’s another story that we’ll look at next time.